The 100% natural UVA/UVB filter offers immediate, reliable and water resistant protection from the sun’s rays. The cream is quickly absorbed and does not leave a greasy residue. Organic shea butter and organic pomegranate care for the skin intensively, protect against a loss of moisture and prevent skin ageing. Selected ingredients minimise the risk of sun-related skin irritations. Especially suitable for kids and for sensitive skin. Before tanning apply in sufficient quantity and repeat often. Children should be kept out of the sun at midday. Sunburn must be avoided. The 100% natural UVA/UVB filter offers immediate, reliable and water resitant protection from the sun’s rays. The cream is quickly absorbed and does not leave a greasy residue. Organic shea butter and organic pomegranate care for the skin intensively, protect against a loss of moisture and prevent skin ageing. 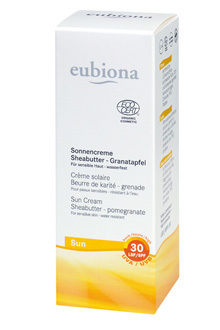 Selected ingredients minimise the risk of sun-related skin irritations. Especially suitable for sensitive skin.